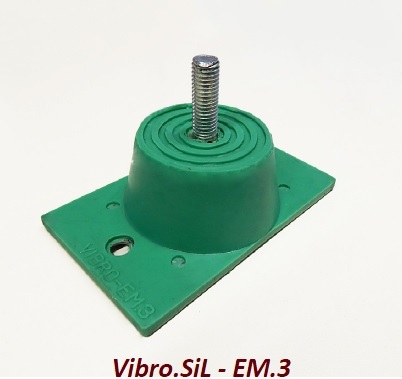 The silicone anti-vibration metal – rubber mounts, Vibro.SiL-EM.3 can offer high vibration protection for compressors, pumps, fans, exhaust gas pipes / muffler support, sensitive electronic equipment, in avionic, marine, military and medical applications, where a wide temperature range (-40 to +200°C) occurs. Suitable also for food-industry applications (bakery ovens, refrigeration rooms etc). The advanced design of Vibro.SiL-EM.3 is a result of specialized research and it is made by a high quality silicone polymers. 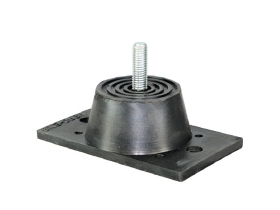 Provides an effective shock and vibration isolation protection, much higher than natural rubber and thermoplastic compounds. It can achieve a large deflection capacity and a low resonance point. Silicone polymers offer very good weathering properties, ozone UV resistant, ideal for outdoor use. Suitable for frost and snow conditions. 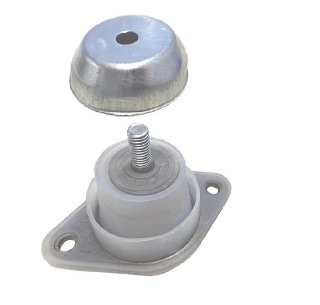 All the metal parts are covered by silicone rubber, providing an oxidation protection. Silicone gel is softer than natural/viscoelastic rubber and others thermoplastic compounds.